A picture of modern affluence and old-fashioned Southern charm, Charlotte, NC offers the best of the old and the new in all aspects, including its dining options. 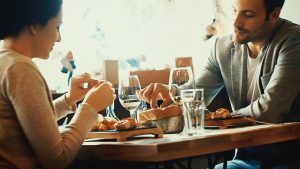 Fine dining restaurants in the city offer a wide variety of cuisine, from classic American favorites to modern gastronomic fare from the country’s top chefs. Here’s our list of five fine dining restaurants in the city that you simply have to try. In addition to its excellent food, this beloved restaurant’s charm and appeal comes from its aesthetically delightful setting. The Fig Tree is housed in the historic Lucas House, a 1913 Craftsman Style bungalow located across Independence Park, one of Charlotte’s earliest public parks. The grounds feature four Brown Turkey fig trees, after which the restaurant was named. The interior includes five elegant dining rooms, several grand fireplaces and a full service bar. Customers can enjoy al fresco dining at the restaurant’s large veranda and patio. The Fig Tree’s seasonal menu is rich with French and Italian influences, and captures the flavors of the wine country. It makes use of the freshest natural ingredients, and its dessert selection is one of the many reasons why patrons keep coming back. The food is prepared with wine compatibility in mind. The Fig Tree boasts an award winning wine list that includes top names from around the globe. The Fig Tree Restaurant is located at 1601 E 7th Street. Consistently described as one of Charlotte’s best, this restaurant offers New American cuisine with a seasonal menu and a carefully selected wine list. It makes use of local organic produce, cheeses and meat, in keeping with its philosophy of bringing community consciousness to the fore. Among the dishes on the menu are chops, steaks, seafood, North Carolina trout and roasted quail. The 45-seat restaurant has a cozy, welcoming vibe that will make you feel like you’re enjoying an intimate dinner party at home instead of dining at a restaurant. It has received numerous accolades from various publications and restaurant review sites, including Zagat, USA Today and Southern Living. Barrington’s Restaurant is located at 7822 Fairview Road. This restaurant brings the best of French cuisine to Charlotte, with such dishes on the menu as escargot with puff pastry, Duck a l’Orange and duck confit. Each dish comes with elaborate plating, making dining as much a visual experience as a gastronomic one. Elegantly appointed, the restaurant has a tranquil, refined ambience that’s rare in many dining establishments today. Regular customers rave about the food’s exceptional flavors, from the oysters to the carpaccio to the bread pudding dessert. Lumiere French Kitchen is located at 1039 Providence Road. This popular steakhouse chain offers outstanding steaks that Charlotte visitors drive miles to enjoy. In addition to their famous steaks, The Capital Grille also serves lamb, fish, seafood and burgers. The restaurant has a “clubby” atmosphere and a bar that encourages socializing. Customers are all praises not only for the food but the excellent service as well. Offering its own take on New American cuisine, this restaurant is one of the favorites in Charlotte, consistently getting high ratings on restaurant review sites. Its dinner menu is a lively array of all time favorites, including steamed mussels, beef carpaccio, pork chop, shrimp or vegetarian grits and buttermilk fried chicken. The restaurant strives to use fresh, organic local produce and offers generous daily specials. The welcoming interiors are decorated in the Art Nouveau style, with mahogany and copper accents. Carpe Diem is located at 1535 Elizabeth Avenue.